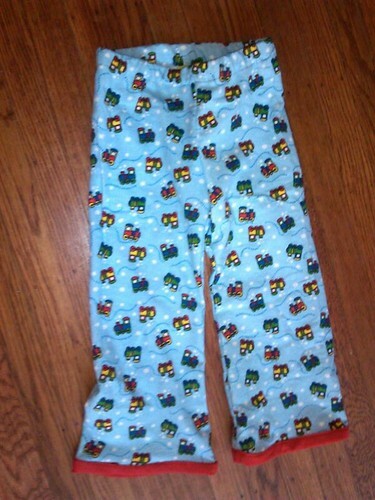 Inder Loves Folk Art: Train PJs. As you know, sewing for Joe has been a struggle recently. He has been rejecting mama-mades, refusing to even try things on. It's super discouraging. Okay, I'll be honest: it just plain hurts. So I took a break from sewing for him. I have been sewing for myself and a little bit for Maggie recently, but not so much Joe. Which made me sad. 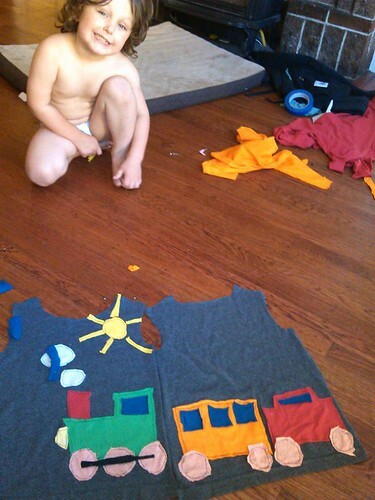 I love sewing for my kids. Both my kids. But I'm part of an awesome network of sewing ladies, and we send each other scraps. Recently, one of my awesome ladies sent me some train flannel. More than a scrap - about a half yard, actually. I showed it to Joe and asked him if he would like "soft pants" from it? 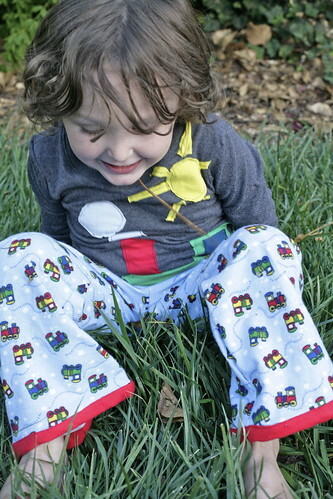 "Yes!," he said immediately, "PJ pants!" Oh my goodness, Joe wants me to make something for him? Maybe I'm a sucker, but I immediately got to work, before he could change his mind! I pulled out my Parsley Pants pattern and laid it on the fabric. The piece of flannel was just a hair short. No problem! I have plenty of red flannel. I'll add little cuffs. Woo-hoo! Zoom, zoom, stitch stitch ... BAM! Done. Without any pockets or details, it doesn't get much easier than this pattern. I took a quick shot with my cell phone to share with my generous friend who sent the fabric. But would Joe actually wear them? I still wasn't sure. Joe is starting his second year of preschool next week. We absolutely love Joe's preschool. I mean, there are no words. Joe's wonderful teacher and the other parents have welcomed him into the fold, quirks and all. And Joe is a quirky kid - while he is growing out of his speech delays, he is still a quiet, introverted kid. They really love him, just the way he is. And I love them for that. "Hey, Joe, do you want to make a t-shirt? A train shirt?" I pulled a dark gray adult t-shirt out of my giant "refashion" pile; a too-large souvenir from a work trip I took years ago. Joe said, "That shirt is too big for me!" "Yes, it is! But I'm going to cut it smaller. Do you want to help?" Out came the Flashback Skinny Tee pattern. Joe "helped" me pin the pattern to the t-shirt, and returned the pins to the pin-cushion when I was done. (It's never too early to teach kids safety around pins!) When I was cutting, I asked him if he wanted short sleeves or long sleeves. I was thinking short, since it was about 85 degrees today, but he pointed to his wrists and said "I'm getting to be a big boy, so I want big sleeves." Um, really? Okaaaaaay. Incidentally, it was so warm that at this point Joe had shed his (short sleeved) shirt. Then we started to design the shirt. I asked him what colors he wanted for the steam engine and he said "Green, blue, and red. With pink wheels." 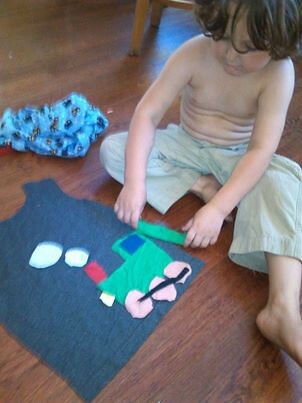 I cut out shapes from my knits stash, and he showed me how he wanted it. Then I sewed it down while Joe supervised. At some point he lost his pants too. It was a really hot day! Joe was very particular about having a sun on his shirt. And it had to have the right number of radiating spokes. Initially I tried to do a "half sun" up next the shoulder, but he wasn't having that. "I want an orange passenger train! And a red caboose!" "Well, okay, but we're going to have to put them on the back of the shirt, you know!" By the time we got this far, the dining room was covered in small scraps of knit! "Almost done, Joe! Now I have to sew on the sleeves and finish it!" 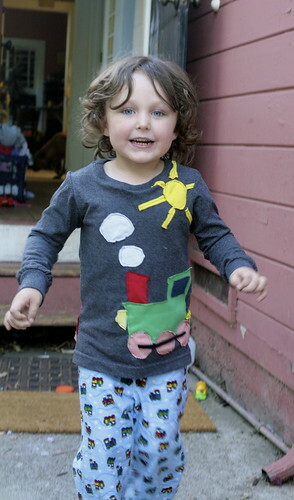 When I finished the shirt, he wanted to put on his new PJs right away. And happily ran into the backyard for a photo shoot?! Who is this child? He loves his new PJs! You have no idea how happy I am! I am still grinning! It turns out that letting Joe design his clothes helps! And I have to say, he has good taste. He was exactly right about that sun. It's my favorite part of the shirt. Joe's hair is getting so long. When I comb it out in the bath, I always ask him if he'd like to get it cut, and he tells me, "No, I want big hair. Like daddy's." Snort. I can't argue with that! 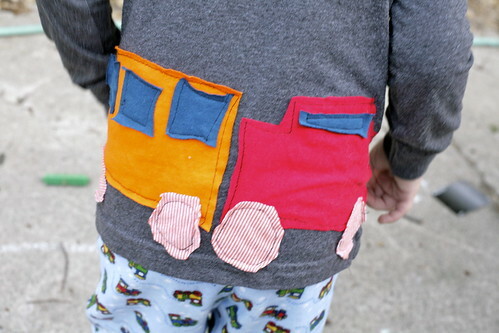 I'm not going to win any awards for this applique, but I wanted to be able to follow Joe's directions without much fuss. In the end, I love the primitive, child-like look. And so does Joe, apparently! They look FANTASTIC! He really does have great taste. Oh wow, so beautiful! All of it, including the sun and the big hair :) Ah yes it always helps to get the client involved in the creative process and have ownership of the end result! What a great design team you and Joe make! 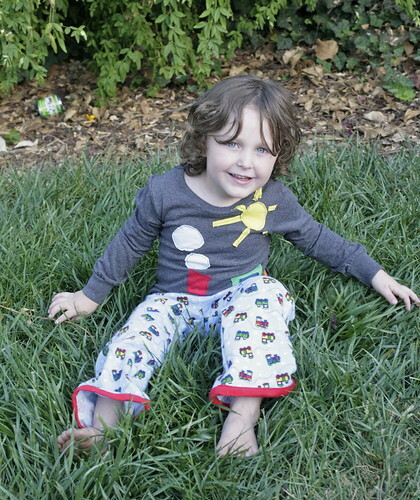 The pjs are so cute and he looks radiantly happy with them. That shirt is AMAZING! I love it, and that you two made it together, so cool! inder, this is simply inspired! i love it. when my son was in kindergarten the teachers had them create their own monster appliquéd shirts. they designed their own monsters using fabrics, and a couple of other moms and I did the sewing. it was so fun! i love that you chose knits - i had never thought of that, but then you don't have to worry about the fraying. great idea! this post also inspired a convo between my son and me about sewing. i used to do more sewing for him than i do now. truthfully, i am just not too inspired to sew t shirts nor am i really inspired to sew simple/basic pants. (he's getting a little old for 'cutesy'.) 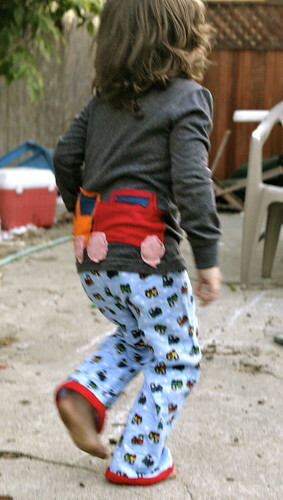 the one pair of pants i did make for him, he never wore (the sandbox pant - O+S) and they took me quite a lot of time to make. in our family, we are long over the idea of everything being "fair" all the time. instead we look to and try to amplify each of our individual giftings. jude spends a lot of time in the garage woodworking with dan - something the girls just haven't been interested in (at least not yet). but awhile back i picked up some star wars fabric for him and we talked about me making him pj pants and maybe a pillowcase. i'd love for him to sew the pillowcase himself. he's actually very good at sewing. he was excited about that. I love love LOVE everything about this! The outfit is wonderful, and I would kill to have his hair. Well, okay, kill is a strong word, but I am deeply envious! <3 you guys! Big hair, like daddy's! Adorb! mama-made shirt for the win!! Okay, I just have to say how much I love that this was such a collaborative effort between the two of you. Not only is is the shirt absolutely adorable but how cool is it that you made it together? A heavily modified Eucalypt dress. Family dinner and other conundrums.